Org De Rac organic wine estate is situated on the south facing slopes of Piketberg, at the edge of the Swartland Wine Region. The vineyards are easily visible from the N7 as one crosses the Berg River, driving north towards Namibia. Org De Rac means “organic from the vineyard” and the estate is one of the first in South Africa to be farmed organically from inception. Grapes are grown in virgin soils that are carefully nutured with rotational cover crops, natural compost and organic fertilizers. Vines have been planted to take best advantage of the cool winds that blow off the Atlantic Ocean; the estate’s location only 50 kilometres from the coast, means that it experiences a substantial day-night temperature differential and moderate climate that is well suited to the production of fine wines. Org de Rac’s organic approach to farming is born out of a deep love and respect for the environment, and a desire to produce natural, healthy wines. joined Org de Rac in 2011, bringing with him 38 years of experience. 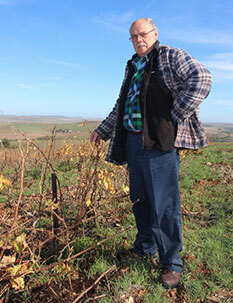 Over the years Frank has worked in wholesale, wine estate and cooperative cellars in South Africa and also has extensive overseas experience. Frank’s approach to winemaking is to pay attention to detail and to strive for complexity in a wine. He enjoys the challenge of working with organic winemaking techniques, using only natural additives to enhance the quality of the wine.